In the run up to Dayton my Shack Computer had been acting up. Latency Spikes and gremlins that were giving PowerSDR no end of grief. Thought a decent dual-core Dell, I was even considering replacing the machine. Troubleshooting found only erratic symptoms. The underlying cause(s) just weren’t easily found. On return from Dayton middle son Winston KC9FVR/AG asked if we could run up the station so he could try some PSK31, having been reading the Digital HF book bought at the ARRL booth. We couldn’t get things to run very smoothly and after a very rapid shutdown in response to a sudden lightening storm powerful enough to set fire to buildings only 10 blocks away, the system would no longer recognize the Flex-5000A hardware. Utilities and Testing showed that the OEM Dell Firewire card gave up the ghost. Quick research at the Flex-Radio Knowledge Center & Forum Archives identified the best cards for performance and roughly $25 later a card was on its way rushing from Amazon. Took the downtime to do ALL updates – from BIOS to any driver/software/system update that could be done. Also left the machine running a very in-depth anti-virus scan which ran overnight (all clean enough to pass). The new card was truly PnP (Plug-n-Play) and despite having a different chipset than advertised (putting it into an OK-class rather than preferred-class for PowerSDR use) the system quickly reinstalled the “Found New Hardware” of the Flex-5000A. Operator error led me to fight with VAC (Virtual Audio Cables) and settings – trouble I could have avoided by a simple reboot. Once running it was lickety-split to help Winston KC9FVR/AG put a handful of PSK31 QSOs under his belt. The drive that comes from a fresh license upgrade and an experimenter’s mindset had Winston KC9FVR/AG quickly asking – can I run fldigi from my Linux Thinkpad using some of your other gear? So to the garage to raid the go-kit stash. Up went the 20m Hamstick Dipole on 12 feet of surplus cameo-poles and a trial of a Small Wonder Labs PSK-20 I had ended up with somewhere along the way. We had little joy with this setup, and it is uncertain if the PSK-20 is needing repairs or if we were struggling with Linux sound issues. So out came the SGC-2020 Transceiver and the NUE-PSK Modem. This combination hadn’t really been used. The NUE-PSK modem had come back a few weeks ago from a full update at Midnight Solutions bringing it up to Version 5 with all the add-on features, and the transceiver had been run but once. Plugged in the SGC-2020 and cabled up the NUE-PSK and “PING” we were on the air just that quick. Winston KC9FVR/AG complete a QSO and then declared the micro-keyboard “worse than texting” and dug out an old full sized IBM clicky-clicky keyboard which worked wonderful. Of course we weren’t about to read the manuals any further than the absolute basics to get things running, so we were hand-typing everything. Macros are for sissies (or for those who read the manuals). Winston KC9FVR/AG downloaded a PSK31 app for his Android Phone and it was neat to see it decode from the speaker’s sound output. My go-kit HF gear did digital just fine! Power needs are such that I think I could get more than 12-18 hours of full duty out of each of the gell-cells I have set aside from their storage charge levels, and days if they were topped off first. Remember that “spark of interest” that comes with a fresh license upgrade? 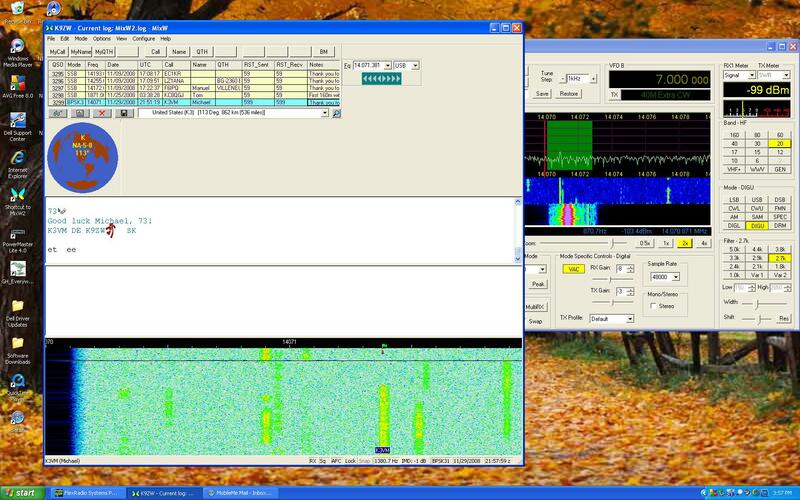 Well it was back down to the shack to run a couple 20m & 160m JT65 demo contacts before promising each other that we would run some Hellschreiber on the weekend. A couple things learned – in terms of the station the dead firewire card really put the main station out of commission. “For want of a Nail” they say the battle was lost, and for want of a working firewire port the station was off the air. Critical Key Component Dependency is not unique to an SDR setup, as most stations lack backups for mission critical items. Almost nobody has a spare for each item in their station. Then the joy of seeing an inquisitive mind wanting to explore amateur radio shouldn’t be missing from an operator’s life. It was wonderful to help Winston KC9FVR/AG explore digital-HF and heartwarming that he would only let this father retire for the evening by making a promise for “more radios, more!” on the weekend! And lastly that it is great fun to pull out the go-kit gear and give it a whirl. Couldn’t think of a finer father-son activity to put one’s work day aside. Just back from my first trip of 2011, with at least six more trips planned or in the final planning, and about six more expected beyond the initial count. Most will be like this one, mainly work with a bit of personal time tagged on to the trip. This last trip didn’t lend itself to traveling with radios, especially as I would have little opportunity to set-up and work a station, and that we traveled as a group of seven with events scheduled throughout. Several of the next trips will be easier to travel with radios, and should have some “solo down time” where I could operate. The Satellite Set-Up where I will be in any one place for less than two days and/or will have at most limited operating time. In addition to the laptop I typically already have to take traveling for work, the gear would easily fit into a briefcase, would take less than 15 minutes to set up, and could be a real challenge with rewards for any QSOs I could score. And second a PSK-31/Digital Set-Up for trips where I’ll be somewhere more than an overnight or two, will have a likely spot to put up a basic antenna, and operate for at least a few couple-hour sessions. Figure that I can fit everything into half a suitcase and under 25 pounds with some care. NUE-PSK Modem, a small 20 watt or less transceiver & matching power supply, and an ultralight antenna should do the trick. For drive-to trips it might be just as easy to take my portable HF station, rather than fuss with a small station. Very undecided about whether to take any gear out of country – whether it is going to be worth the effort given the nature of those trips. Maybe next set of overseas trips will have a better Amateur Radio profile. REPOST & UPDATE: Had a very nice QSO with Clint KK7UQ by PSK31 using the Flex-5000A and after discussion decided to repost an update on his excellent PSK31 IMD Meter. I originally built a kit version, but presently only a fully built version is offered. This has to be one the most fun kits to build where the finished product is something you just can’t buy easily – the KK7UQ IMD PSK meter. Since not all of us are up on the jargon, let’s run it down. The IMD Meter Building Experience is one of great fun and an outstanding product when you’ve finished. When the IMD meter was designed, the FS (field strength) was added as an afterthought. The number output is related to the attenuation of the AGC circuit – it turns out to be about 1 dB per digit. I have found, and others have told me that the FS is useful. In my case, my antenna is an 80 meter full wave horizontal loop, located several hundred feet from the shack. I have a remote tuner there to minize transmission line loss when the frequency is away from the resonant points. I use the FS mode to let me know if the tuner is working and that RF is actually getting out. Of course, the FS varies from band to band, since the pattern of the antenna changes with different bands, but the FS per band is very repeatable. I have already detected a bad connection at the feed point, and a tuner that didn’t like running in contest mode for 6 hours straight. Another case was a Russian ham who used his IMD Meter in FS mode to help tune his mobile screwdriver antenna. So this has turned out to be more useful than first thought. The IMD Meter is manufactured in the US. N3JJA manufactures the IMD meter; sales and service is by Glenn W3GWW. The parts, of course come from all over the world, but the PCB, the cases and the assembly are all done in this country. Glenn W3GWW also sells the Navigator interface which is one of my designs. It is also manufactured in the US. Assembly is done by automatic equipment in California, testing is done in Washington, and sales and service are done in Maryland. The unit has undergon Part 15 FCC certification and is designed and manufactured to ROHS standards. Either KK7UQ’s IMD Meter has my Recommendation, and are a welcome addition to any shack with digital operations. Took a few minutes (would be quicker if I read the directions) to set up the Flex-5000A to use MixW and a neat internal interface called “VAC” (Virtual Audio cables) to set up the Flex-5000A for Digital Mode. I’ve a ways to go to make this all work as I would like it to. BTW with the speed of the new machine it looks like all my logs could be merged. I had avoided this on the old XP Box as it was easily overwhelmed whenever my logfile got big. For details on the setup using MixW and VAC see the Knowledge Base and Manuals at Flex-Radio. USB card for NUE-PSK modem … nearly ready! Here’s an update on the progress with the USB add-on project for the NUE-PSK Digital Modem … full details and photos, schematic, etc are on the modem website at www.nue-psk.com/usb. The “NUE-USB” add-on card development is nearly complete and we are awaiting production cards from the fab house. We’ll start taking orders shortly and we can start shipping in about two weeks when the pc boards are received! In a nutshell, the USB add-on card will make your NUE-PSK Digital Modem more flexible and more useful with its ability to record QSO receive and transmit text to a USB flash memory stick for archival and remote printing. The USB card also provides a serial connection to a PC, a port for a USB printer, and (soon) a real-time clock/calendar function to timestamp QSOs. The updated modem software contains the new keyboard commands for controlling the USB card functions, plus a wonderfully-revamped and consistent text editing commands. 1) Fully assembled & tested — Make a few easy mods to your modem, load up the latest modem software, plug in the USB card and start recording QSOs! 2) Partial kit — PCB and all parts are supplied, with the LQFP 48-pin surface mount controller attached and programmed. You just attach the remaining parts. 3) Full Kit — PCB and all parts are supplied. You attach the LQFP 48-pin surface mount controller and program it yourself with a PC serial port and free software. 4) Modified Enclosure (optional) — Lower half of the aluminum enclosure clamshell with mounting and connector/LED access holes. 5) Full Factory Upgrade — Don’t want to do any of this yourself? Just send us your modem and we’ll return it with the USB card fully installed and operational. 3) Built-in USB connection to the PC for “field programming” of modem software updates — Once the modem is updated with the latest software (containing the USB feature support), the USB card’s “B” connector will allow a USB Host cable connection to the PC for download and programming of new software releases, as well as for communication with other devices. 5) Built-in Real-Time Clock/Calendar (pcb traces only) — Provisions have been made on the board to support a PIC controller in order to maintain current date and time, ultimately for use by the modem and in the recorded data going to the USB memory stick. Other than the schematic and board layout supporting the PIC circuitry, this feature has not yet been designed – it is hoped that others will help out by adding to the Open Software modem project. The task involves designing the PIC software and hooks in the modem’s dsPIC software … a separate Modem RTCC requirements document is available for those wishing to help with the project. The USB board plugs into the main board by means of a mating female connector to the modem’s P4 “Field Programming” pinheader. Minor and easy mods are required on the modem pcb to supply 5 volts to the P4 connector (instead of 3.3V), and to bring two extra control lines out to a new connector that plugs into the USB card. The USB card is the same y-dimension as the modem board, and it extends 1-1/8″ in the x-direction over to the left edge of the enclosure. The board sits even with the main board, supported by two standoffs on the left side and a 4-position SIP female header on the bottom that extends out the right side of the board to plug into the existing P4 connector. The heart of the design is the Vinculum VNC1L FTDI controller chip. Although more expensive than “USB bit banging” alternatives, the VNC1L chip provides support for the full USB protocol control, and a DOS-like command line interpreter that allows easy writing and reading of a flash disk, making it a relatively easy design-in for USART ports such as we have available on the NUE-PSK modem. (For a great overview of the product, see the July 2007 issue 204 of Circuit Cellar magazine http://www.circuitcellar.com). Additionally, the VNC1L chip offers Host mode support, which allows the USB card to serve as the “serial interface” to a PC, providing a way to load modem software into the dsPIC as before, as well as providing communications to other devices downstream. I’ll be upgrading mine as soon as the full release is out! 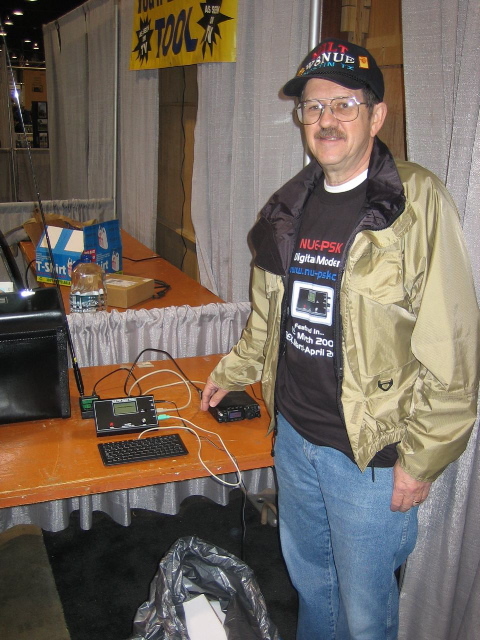 I had a long chat with Milt Cram, W8NUE at AmQRP’s NUE-PSK Booth. Though I received the NEU-PSK modem I ordered under the early-bird program a few weeks before Dayton, I had made less than 20 QSOs with the unit and was eager to learn more. Presently there is a firmware update that Milt W8NUE offered to install if I had my unit with me. (I didn’t) Future Firmware Updates are planned to expand the ability of the modem! Additional Modes and Logging Ability are high on the list. Following the NUE-PSK reflector since Dayton some of these features are becoming reality, and again I need to get out the same interface I use with my Arduino boards to update firmware. Fellow AmQRP team members were final assembling full kits for sale at the booth and demonstrating the modem to the gathered crowds of amateurs. Not surprising that this excellent Modem Project has a personable and excellent team behind it!